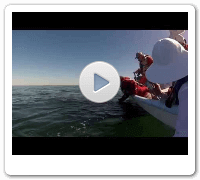 Perhaps the most extraordinary wildlife encounter on the planet is a visit to San Ignacio Lagoon to meet up close 40 ton Grey Whales and their newborn calves. Grey whales mothers often seek out human interaction as they approach our boats to present their newborn calves to us while encouraging visitors to scratch their head, back and baleen as they lounge around our boats. Over the years this behavior has become a regular occurrence only at San Ignacio Lagoon. 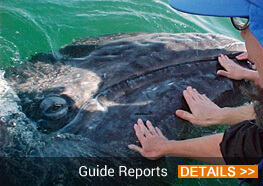 Our remote location, spectacular views and variety of activities combined with our full service Eco-lodge and comfortable cabins with electricity make Campo Cortez an ideal choice for your Grey Whale watching adventure to San Ignacio Lagoon.